When there is no freedom of press, when there is no freedom of assembly, when there is no right to a fair trial and when the perpetrators get away with murder, what do you do? Well, here are a few suggestions from what is going on in Zimbabwe. This is not the only place suffering like this – just mention Burma/Myanmar, Cuba, and increasingly Putin’s Russia. 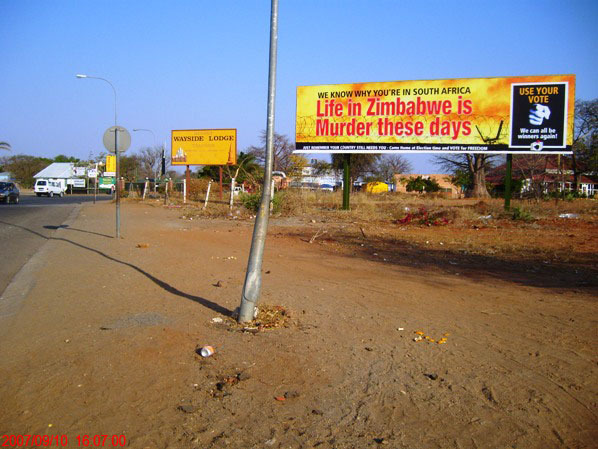 But the fact that these things are going on around and about Zim is encouraging. But what they all have in common is that they all involve either lateral or out of the box thinking. Without a context, they will seem puny. But their power lies in their ability to make ripples and even waves. As an Anglican this is what I wear to identify myself, that I’m a clergyman. 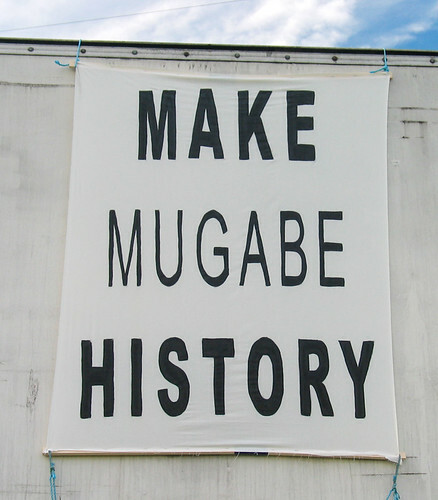 Do you know what Mugabe has done? He’s taken people’s identity and literally, if you don’t mind, cut it to pieces. This is what he’s actually done to a lot of – and in the end there’s nothing. So, as far as I’m concerned, from now on I’m not going to wear a dog collar until Mugabe is gone. If you have the opportunity to attend summits or conferences to which Mugabe is inexplicably welcome, then you can always dress up in funny hats and protest outside against the people who give him the airtime/elbowroom (as happened at the recent EU/AU summit in Lisbon). But if you are really keen, you can always try to perform a citizen’s arrest. This is of course what Peter Tatchell attempted not so long ago – on 3 different occasions as it happens – good on him, I say. But a risky tactic of course. There are lots of ways of doing this. Here are some pretty clever ones: (from L to R, a banner on a Lisbon beach at the summit, a billboard just inside the South African border with Zim, multi-purpose message to consign not just poverty to history). Dictators love to take themselves seriously. Which is why it makes such a difference when others don’t. There is nothing more diminishing than a well-aimed cartoon or sketch (remember Steve Bell’s cartoons of PM John Major wearing his underpants outside his trousers – not that Major was remotely like a dictator, of course, as even his detractors would accept). So distribute and laugh – for sometimes that is all you can do. This is where the Internet can come in REALLY handy. Check out Sokwanele (which means ‘Enough is Enough’) – this has tons of info, news and above all mockery. Here are a few greetings e-cards that can be distributed liberally. Not exactly Christmasy or festive – but then problems like these don’t simply disappear when we have our holidays. Yes, that’s right. Playing cards will help to subvert the regime and spread the message. This pack is now one of my most prized possessions. I was given it last year by a friend who had friends – they were produced by regime opponents abroad and to be caught in possession of this inside Zimbabwe would almost certainly lead to arrest, deportation for foreigners or worse for locals. On the outside it looks like a completely innocuous set of playing cards (see below left). Ideal for distribution around bars and buses throughout Zimbabwe. But open up the pack, and you have a beautiful aide-mémoire of the realities of modern Zimbabwe. It is a whole new means of secret political dissent: PROTEST & PLAY. I’ve scanned the lot and put them on my Flickr page simply because I do not have easy access to Harare bars or Bulawayo buses from central London. Some of the objects of ridicule will be unknown to non-Zim residents – but you don’t have to know the names to understand the point.